Garlic chives are hardy perennials that survive winter even in very cold climates. Carrot, Grape Vine, Rose and Tomato. 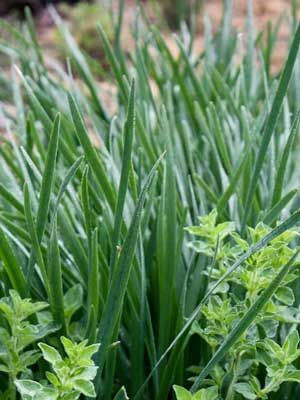 Often planted with oregano, thyme, and other mound-forming herbs. Start with a purchased plant, or start seeds indoors and set out at about the time of your last frost. Plants spaced 15 cm (6in) apart will grow into a solid mass in 3 years. Garlic chives produce white, lightly scented flowers in late summer. Gather them for use as cut flowers to keep garlic chives from reseeding. Like regular chives, garlic chives can become invasive. Do not harvest in the first year. In spring, gather handfuls of greens for use in the kitchen. The leaves become somewhat tough in summer. Deadhead garlic chives to limit reseeding.